Sliding glass shower doors are a popular design thanks to their flexibility on size, coupled with space saving credentials. On most models a single glass panel is mounted on rollers and slides behind the other fixed screen meaning no outward opening into the bathroom. 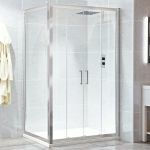 Brands like Phoenix also offer double sliding shower doors to create shower spaces up to 2 metres wide. These are perfect if you require a dry area or if you want to help the kids or a loved one shower. 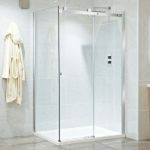 Many sliding shower screens are purchased for an alcove or recess space but most manufacturers also offer compatible side panels to make into a full enclosure for a corner installation. This is true of all but 2 of the models we offer. For the ultimate luxury choose a frameless sliding shower door inspired by European contemporary design. The Phoenix Motion and Aquaglass Glide feature large exposed designer rollers, cut out glass as well as the availability of mirrored side panels. For something simpler and cheaper check out the perfectly capable Shield VI, which even comes with easy clean glass.